This is my favorite railroad building in Georgia that isn’t a depot. It was designed by Charles E. Choate (1865-1929), a Methodist minister-architect with churches, banks and other structures to his credit in Georgia, Florida, and Alabama; I believe it to be a private residence today. 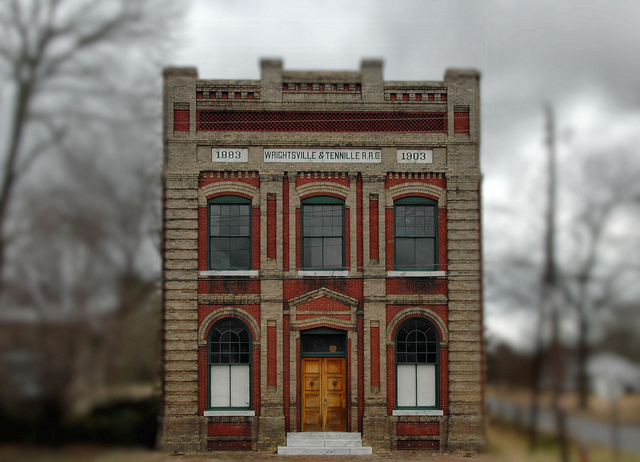 A history of the Wrightsville & Tennille Railroad Company, from the Rail Georgia website: The W&T was chartered in 1883 to build a line from the Central of Georgia at Tennille to Wrightsville, about 17 miles south in Johnson County. Three years later the W&T merged with the newly completed 19-mile Dublin & Wrightsville Railroad, creating a 36-mile line from Tennille to Dublin. In the 1889 edition of The Official Railway List, the W&T reported operating 36 miles of railroad, 3 locomotives, 2 passenger cars, and 5 freight and miscellaneous cars. In 1896, the W&T bought the Dublin-to-Hawkinsville line of the Oconee & Western Railroad and consolidated it into its own operations in 1899. The result was a 75-mile line from Tennille to Hawkinsville. In 1907, the W&T acquired the Dublin & Southwestern Railroad, a 28-mile line between Dublin and Eastman. This would be the last addition to the “Wiggle and Twist,” so called for the many curves along its route. In 1941, both branches of the railroad west of Dublin were abandoned, leaving several communities in Dodge and Laurens counties without rail service. Although it had been owned by the Central of Georgia since 1899, the W&T operated independently for most of its existence. In 1971, it was merged into the parent line and today serves as a branch of Norfolk Southern Railway. Reblogged this on Architect in Wales Blog by RA Architects. Brian, years ago I read a magazine article with a very funny aside about the Wrightsville and Tennille. The article was about the many standardization efforts throughout the country in the 1890’s. One thing that was standardized was the gauge of the nation’s railroads. The writer told the story of the president of the W and T writing to his counterpart at the New York Central requesting the courtesy of employee travel reciprocity on the 2 lines as was the custom at the time. The NYCentral president replied that he could not grant the request pointing out that his railroad was several thousand miles long while the W and T was only 36. The W and T president responded by pointing out that the NYCentral was somewhat longer, but the W and T was just as wide. This looks like my kind of place. Sure wish it were. Great job photographing it. I’m green with envy! I wish this was my residence. What a great building.